Nikon | Imaging Products | Best of the Rest / Nikon Family Cousins, Part 11 : "Nikon EM"
Home > Products & Support > Imaging Products > History > Camera Chronicle > Part 11 : "Nikon EM"
Part 11 : "Nikon EM"
The Nikon EM (Photo) was developed as a small, cute, easy-to-use "SLR Camera for Women", appealing to a market whose needs were not being met sufficiently by conventional heavy, "uncute" SLR cameras on the market at the time. SLR cameras like the Olympus "OM" Series (Jul. 1972) marked a trend toward more compactness. As the Nikon EM underwent development, the release of Pentax MX (Nov. 1976) and ME (Dec. 1976) was announced, intensifying competition in the "compact" SLR camera market. "Naturally, the goal at the time should have been the smallest 35mm(135)-format SLR camera in the world...... smaller than the Pentax ME". However, the result was...... well let's leave that judgment up to you. Adventurous unprecedented experiments were carried out in developing the Nikon EM. With the success of Nikomat (Nikkormart), Nippon Kogaku K.K. gained confidence developing general-use models, and pushed cost reduction and mass production to broaden its market and market share. The initial idea that the camera was to be based on Nikon FM (1977, see part 9.) body was reconsidered, starting with basic camera mechanisms. Take the film winding mechanism. Here, the goal was to minimize the number of gears, making it from scratch by studying past cameras, among other things. 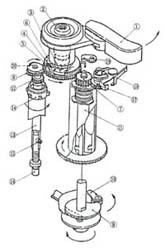 The company concluded that the winding lever should be positioned between the winding spool and the sprocket (See fig. on the left). This, however, provided insufficient space for the winding lever reserve joint, so a special mid-folding winding lever was devised. 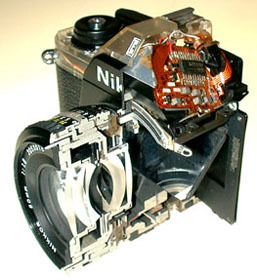 A unique feature of this winding mechanism is that it can wind bit by bit, even though it is a square-type focal plane shutter camera. With conventional square-type shutters, a big lever on the camera bottom moves sideways, and the shutter and mirror mechanism are charged by repetitive sideways movement. This lever is directly connected to the winding axle with a crank, so the winding lever axle also needs to be moved repetitively, making fractional winding impossible. However, in the EM, the rotation of film winding axle is done by the cam and roller's repetitive straight movement, making winding fractional. About the reason why the EM incorporated this mechanism at great risk of making the entire mechanism complicated, which even the upper-class Nikon FM and FE (1978, see part 10.) models did not feature, the designer in charge of this mechanism at that time flatly said : "I don't like cameras that cannot wind fractionally !". Evidently, those were good old days when designer's personal liking might be reflected upon the product in a good way. Developing the EM greatly improved the company's production capabilities, including better use of plastics for exterior parts. The Nikon FM and FE had used engineering plastics on the apron and name plate. With the EM, the top and bottom cover were also made of plastic, thereby reducing the cost and complication of making these parts. However, the use of plastic should not cause a reduction in quality. Therefore, an "EP Technology Dept." was formed to develop plastic usage by studying the characteristics of the material up to final product stage; a concern that continues in developing Nikon cameras. Nikon EM, at first, was targeted at overseas markets, especially the United States. Thus, the camera was first announced at Chicago's "PMA" exposition in March 1979, not at "Japan (Nippon) Camera Show" held right before the Chicago expo. Competitors including Canon and Olympus had also released AE general-use cameras like the Canon AV-1 and Olympus OM10 at around the same time, first overseas, then in Japan immediately afterwards. However, the EM was not released in Japan until March 1980. Editors of the "Asahi Camera" magazine feature, "New Face Diagnostics" the quintessential camera magazine testing reference, couldn't wait. They purchased the camera in the U.S. and wrote it up starting on page 315 of the October 1979 issue. The article "Will the 'mysterious EM' be sold or not sold in Japan ?" asked "Will it ever be sold in Japan ? The camera that's keeping all camera fans in suspense : Nikon EM, a real 'tempting' 35mm(135)-format EE SLR camera". Obviously, the editors were anxious. But the camera was introduced to the market in Japan in March 1980, at the same time as the Nikon F3. Since it was as inexpensive a model as was ever released by Nikon, Nikon was anxious that it not degrade the Nikon brand image. Which is probably why its release coincided with that of the F3, Nikon's high-end camera, and featured classy touches, such as leather trim, for the Japan market. At the design stage, the idea arose to have the EM designed by famous industrial designer Giorgetto GIUGIARO (1938~ ), designer of the Nikon F3. At the start of development, the EM body had a slim viewfinder pentaprism area and slim front part of the apron's bottom area. Mr. GIUGIARO redesigned the motordrive MD-E along the lines of the F3's MD-4, with bottom part slanted and protruding. The change in body complied with change in the diecast. "Yellow Nikon EM" owned by Mr. K.
The final "all-black" design moved away from the initial "camera for women" idea. Perhaps a modification as simple as making the leather parts in brighter colors like beige or yellow (see photograph) might have made the camera more modern and chic !? This issue first appeared in "Nikkor Club Quarterly" magazine , published by the Nikkor Club, and was revised for Nikon's webpage. Products, brands and companies names are trademarks or registered trademarks of their respective companies.